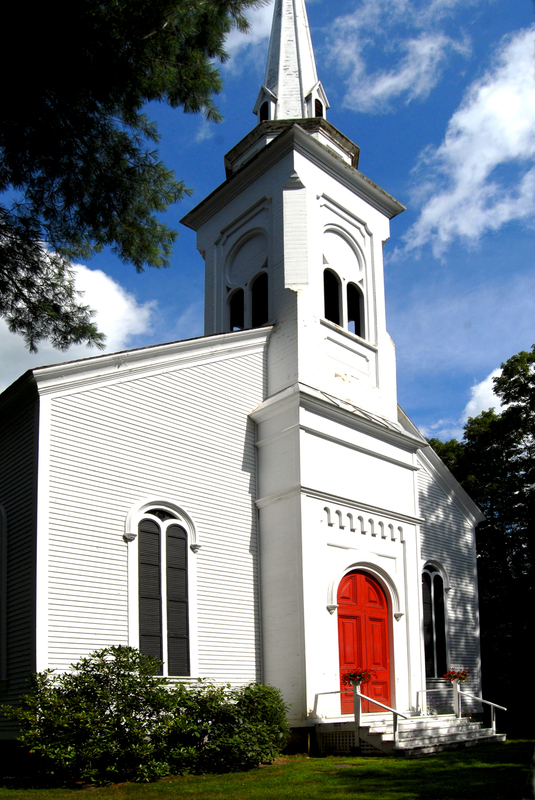 This unusual home is a classic New England Meeting House in the village of Mill River in the town of New Marlborough Massachusetts which is 2.5 hours from either New York City or Boston. It is situated on a rise surrounded by tall trees and beds of annuals and perennials on just under 2 very private acres. It is a short walk to the general store, the post office and the library. The Steeple is ideal as a vacation, weekend or four seasons home and includes an excellent space suitable for an artist's or musician's studio. Mill River is on the National Register of Historic Places. In 1871 Captain John Carroll, a mill owner, provided funds so that his workers could have a church nearby. After many years, the mills closed and the population dwindled. The congregation merged with two other churches. In 1976, this historic building was purchased from the congregation. Sensitively converting the church to a comfortable home for contemporary living was challenging. Architect Bill Potts, who himself lived in a converted church, began the project and the church was ready for occupancy in the summer of 1977. The integrity of the building was maintained with its random width flooring and the many pews that have been integrated into the decor. The original bell remains. The owners have had a rewarding experience becoming part of a friendly, vibrant community where many people are interested in the arts. Living in this spacious home has provided opportunities for many family and community events, including a wedding, fundraisers and art shows.